UMP | University of Minnesota Press Blog: Japan's Fukushima nuclear crisis is latest example of how containing radioactive materials is simply not possible. Japan's Fukushima nuclear crisis is latest example of how containing radioactive materials is simply not possible. Japanese residents undergo radiation checks. Image source. Associate professor of communication at Concordia University, Montreal, and author of Signs of Danger: Waste, Trauma, and Nuclear Threat (2005). At the time I wrote Signs of Danger, the two great nuclear indices were Three Mile Island (1979), and Chernobyl (1986). Hiroshima and Nagasaki were the third index, but here at least, in North America, these events stand as repressed adventures particular to war-time endeavors. In a word, they were not accidents. Today, things have changed, although it is at this point difficult to say precisely how. 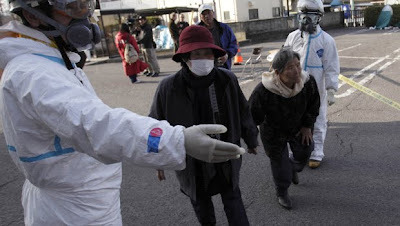 In part, the ongoing tragic events in Japan have spawned a new arithmetic of nuclear disaster. Fukushima equals Three Mile Island plus a staggeringly large earthquake and equally staggering tsunami. Or, Fukushima equals Chernobyl minus its graphite and massively insane reactor design. It’s not Chernobyl, Japanese authorities have been chanting even as the unmistakable signature of fission isotopes scatter across Japan and the Pacific. Here is one of the world’s most nuclearized nations, a nation that in every conceivable way has internalized the atom, mastered the atom, as producer, champion, as victim. And, living as they do at the tectonic confluence poetically known as the Pacific Ring of Fire, they are also one of the world’s most prepared nations for large seismic events. Yet the unimaginable arrived, simultaneously, unexpectedly. As the earthquake struck, the three reactors then operating went into shutdown mode. So far so good. Minutes later, a mountain of water crested the tsunami walls protecting the six-reactor complex from the sea, and stunned operators discovered that the backup diesel generators would not work; they too had been flooded by the tsunami. And worse, battery units, the tertiary power source, capable of delivering power for only a few hours, were effectively useless in the face of damaged equipment and reactors. A general loss of power gave way to a loss of coolant accident, followed attempts to vent pressure, several (resulting) hydrogen explosions, and the eventual revelation that spent fuel ponds were heating up fast, and were possibly damaged, exposing highly radioactive fuel to the air. Talk of “uncoolable geometry” - certain configurations of fuel that cannot be cooled – began circulating on the web. Soon there was news of exposed reactor cores, and now, contamination measurable as far as the west coast of North America. Today, it’s radioactive puddles clocking in at over 1000 millisieverts an hour, and a sacrificial workforce of 600 poor souls – “glow boys” as the American nuclear industry puts it. And Iodine-131, Cesium-137, and reports of Plutonium in the soil near the reactor site (from the MOX fuel, in reactor 3?). This prolonged and indeterminate accident makes of all of us anxious semiologists, attempting to decipher the signs, and the peculiar formalities and disinformation of the Tokyo Electric Power Company. It’s horrifically complicated, really. An earthquake. A tsunami. Old equipment, including a forty-year-old Mark 1, General Electric reactor – an unsafe design, widely and long recognized as vulnerable to containment failure. A corrupt and opaque company – Tokyo Electric Power Company – with a storied and well documented history of concealing information and falsifying records. Exceedingly weak oversight by Japan's Nuclear and Industrial Safety Agency. An ongoing and catastrophic humanitarian crisis in the wake of the tsunami. A deeply ineffectual national government. New evidence of ongoing fission, but no way at the moment, says TEPCO, to know the source of the leak(s). The “accident” was not a failure mode that anyone involved, had recognized as credibly possible. But of course, this is said of every complex technological accident. The point here is not higher tsunami walls – literally or metaphorically – the point is that containment (actual or symbolic) is simply not possible; not on the temporal scale demanded by radioactive materials; the Fukushima crisis is but the latest demonstration of this. There was a moment a few weeks ago, as I cycled back and forth between Reuters, BBC, Al Jazeera, CNN, NHK World, Kyodo News – in the wake, I think, of the second hydrogen explosion – that it seemed like a transformation had taken place. A before and after moment. Surely, now, after this, there can no longer be a shred of credibility, a plausibility, to the intransigent claims of the global nuclear industry. They could no longer appeal to design safety, to carbon-less, green energy, to systems redundancy, to backups, to the maximum credible accident, to risk assessments and preparedness. To responsible oversight. To any of this. The game was over, it seemed to me. Today, I am less certain. Discourses of risk and probability – the epistemological tsunami walls of risk society – remain deeply woven into our cultural, dare I say global, understandings of technological endeavors, and the accident. We will mourn for the Japanese -- for those lost as the sea rose up to engulf the land, for those whose land is now being rendered uninhabitable, and for those who will die in the effort to stem this disaster. Perhaps, too, we will mourn a future imperiled by these practices of the present. Peter C. van Wyck is associate professor and graduate program director in the Department of Communications at Concordia University in Montreal. He is author of Signs of Danger: Waste, Trauma, and Nuclear Threat (Minnesota 2005). His most recent book is The Highway of the Atom (McGill-Queen's University Press, 2010). -The Guardian will publish your ideas for stopping radiation leaks. -The Japan Times on how the disaster holds lessons for the future. -Yahoo! News: Japanese nuclear plant worker discusses choice to sacrifice his life.